Once you have selected the type of vehicle you need (while leaving your options open), and you have chosen where to purchase the vehicle, there are steps that need to be taken at the individual’s house or the dealership. First and foremost, you should know about how much the vehicle is worth before you even look at the car. There is an important book that will help you assess the worth of ANY car in ANY condition. It is the most important thing you can use to help you know if you’re getting ripped off or not. It is your used car Bible. Be kind to it. Sleep with it under your pillow. It is called the Kelley Blue Book (or Blue Book for short). Their web site is really easy to use: just input the potential car’s information, such as its mileage, features, and wear. Once you enter the information, a price will be generated. This is the price that you can expect to be charged by a retail outfit, but it is NOT necessarily the price you should be willing to pay. This is only a starting point and a guide to the possible value of a vehicle. But if anyone ever wants to charge you more than the Blue Book value, then you can simply tell them what the Blue Book value is, and make them prove that it’s worth more. The seller will see that you’ve done your research, and will be a lot warier of trying to trick you. Once you have selected a vehicle from an ad, you must visit the owner and inspect the vehicle. Begin any car-purchasing venture with the understanding that the car you get will not be perfect. Few vehicles, even new cars, are perfect. What you are trying to find is a vehicle that suits your needs, fits your budget, and has never been used to dispose of a dead body. With this in mind . . .
* Be sure when you arrive at the residence of the seller that you take good notice of the appearance of the dwelling. Someone who takes meticulous care of a house and yard is more likely to take meticulous care of a car, changing the oil when necessary and maintaining the vehicle on time. * Begin any encounter by being friendly. Creating a relationship with a prospective seller can help you down the line when it comes to negotiating a price. * Inspect the vehicle carefully. You are not looking for scratches in the paint (there will be a few) or even small fender dings (they will be there also). Instead, look for serious wear and tear, like worn down parts, broken parts, or missing parts all together. Signs of serious wear and tear are more important than any small scratch. * Be wary of any vehicle that has after-market work done. That low riding ‘82 Vanogan may look great, but will the work affect the reliability in the long run? After the preliminary inspection, it’s time for the best part of the deal: the test-drive. One rule of thumb for the test-drive is that if a car breaks down while test-driving, you should not buy it. Beyond that, there are several other guidelines to follow. * Be wary of any seller who will not permit you a test-drive. * Be sure that you take the vehicle on several different types of road surface. * Make sure you test the pick-up of a vehicle on a highway. * Find the bumpiest portion of road that you can to test the suspension and overall ride-comfort of the car. If you decide that the vehicle is for you, there are still some things that need to be done. Ask the owner to see the maintenance records of the vehicle. If he/she cannot or will not produce this paperwork, then fuggedaboudit. This is a warning sign that the vehicle may have trouble that the owner is trying to hide from you. If all of this checks out, you must next have the vehicle inspected by a private mechanic. This should cost $40 - $60, but it is a small price to pay to make sure that you are getting your money’s worth. Finally, the negotiation should be approached very carefully. Every private seller should expect to get less than they ask. Do not accept the first offer unless it is too good to be true (and in that case you want to be very careful). In the same respect, do not insult the seller either. Offer a fair price below what they are asking and work from there, using your Blue Book number as a guideline. If your inspection of the vehicle has revealed some minor problems, use them as bargaining chips to lower the price even further. If you are leaning toward making a purchase from a dealership, there are different (though just as numerous) factors to consider. There’s a reason that used car salespeople have bad reputations. 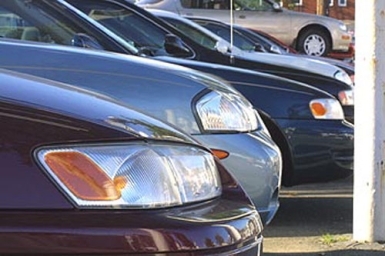 Step one is to make sure that you visit several dealerships that have the type of car you’re looking for. To help you in your search for a dealer, you can visit Yahoo Classifieds. This Yahoo! site can help you locate a make and model that you desire and then put you in contact with a dealer in your area. There are positives and negatives about using a dealership. While you can expect to find vehicles with low mileage and in better shape, there are some essential questions that you must be prepared to ask and there are several dealer “tricks” that you want to avoid. 1. At a dealership, you can expect to encounter salesmen and saleswomen who have a high stake in ripping you off. We call these people “commissioned thieves.” Though they are operating from a different frame of reference than a private seller, some of the same rules apply. A friendly rapport built between yourself and a salesman can assure that you will, in the end, get a more fair deal. Assume that every salesperson is out to get you, but also assume that some of them have a heart behind that shark-like personality. Also, if you go in there acting like a jerk, he or she WILL try to rip you off. A private seller gains his or her profit from the sale of a vehicle outright, while a commissioned salesperson will make a portion of the profit (the dealer’s take) as well as money for added extras that you purchase. It is important to be prepared for these “extras” before you even visit the dealer. 2. Consider how you’re going to pay for the car. If you’re rich, then just plunk down the cash. But if you need to use some kind of payment plan (as most people do), it is essential to try and obtain pre-approval on a loan before even setting foot on a showroom floor. The dealer will try and convince you that his/her financing plan is better than the bank’s. However, unless they are offering a special sale on car loans, a bank is more likely to provide a better loan on terms you can handle. * Since it takes about two to three hours to close a deal, it is essential that you show up 90 minutes before the store closes. Yes, you heard us right. The later you can get in the door and get dealing, the more likely you are to get a good deal. Why? Well, even used car salespeople are human, and they get tired too. At the end of a long day, they’ll be more likely to not feel like haggling rather than when they are fresh in the morning. They wanna go home too. * NEVER make the first offer. It might seem that it makes sense to walk right up to the dealer and tell him/her, “I am willing to pay for thousand dollars and not a penny more, I swear.” There are two problems with an approach like this. First, the dealer may have been willing to give you a better deal, but now you have told him/her that he/she need not go lower. Second, if you are bluffing, you may find yourself out on the street without the car before you know what hit you. * If you decide to take the dealer’s financing or the dealer is assuming that you will (not passing on the financing immediately can sometimes help you get a better deal in the long-run), then you should be aware of a second dealer trick. Never answer the question “Would you take the car tonight if I could get you a $250 monthly payment?” This is one of the oldest tricks in the book. What he/she has not told you is that the loan is for 19 years at an APR of 456%. In the end, the most important thing is the total price of a car before financing. After that, factor in the financing to see if the deal is for you. * Be wary of phrases like “what will it take to get you into this car today?” or, “I’ll have to check with my manager, I don’t think we can go that low,” or, “it’s a steal at this price.” Chances are, the salesperson has said the same thing to about four dozen people already that day. Don’t feel guilty about making them check with their manager (chances are, they won’t even check!) and don’t let their language pressure you into making a purchase that you don’t feel right about. Remember that the salesperson is there to assist you, not the other way around. * Other add-ons like car alarms, warranties, rust coating, in-dash microwaves and such can add up when it comes to the bottom line. Ask exactly what each add-on does, and decide whether you want it or not. Sometimes the salesperson will tell you that “everybody gets this add-on.” Your mother would be very disappointed in you if you fell for that lame argument. While most additional offers should be declined, a good warranty (especially if it comes through a major auto manufacturer) can be an added plus. Make sure you check the warranty terms, coverage, roadside assistance and other variables. After all of these decisions have been made, get ready to sign your life away. * Make sure you read everything before signing. A typo could “conveniently” slip into the contract. A final option is the used car superstore. You can approach this option with slightly less anxiety than the other options. The test-drive, inspection, and choosing process are just about the same. The difference is the negotiation. Usually, the salesperson does not operate on commission and the price on the window is the price you pay. It does not hurt to attempt to negotiate, but it usually won’t do much good. Be wary of the add-ons just as you would at any other dealer, and make sure the car is for you. May 27, 2008: Blog Your Site | Where To Find Information About New And Used Cars?